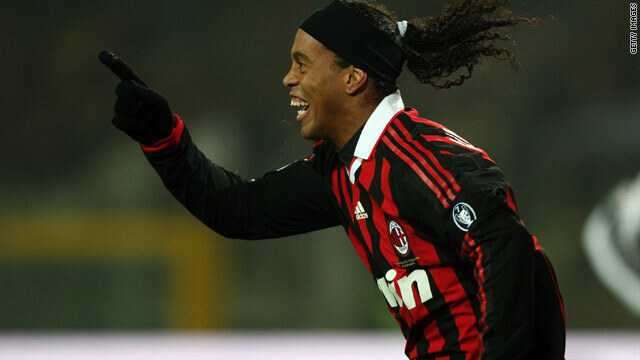 Ronaldinho continued his recent run of goalscoring form with his first Milan hat-trick in the 4-0 thrashing of Siena. (CNN) -- Ronaldinho plundered a hat-trick as AC Milan crushed 10-man Siena 4-0 on Sunday to close the gap on Serie A leaders Inter Milan to just six points and with the Milan derby to come next week. Milan also have a game in hand meaning they could potentially draw level with the four-in-a-row champions if they were to win next weekend's crunch clash. The hosts started in determined mood following Inter's 2-2 draw at Bari on Saturday and Ronaldinho took an Alessandro Nesta cross on his chest on three minutes before sending a spectacular overhead bicycle kick just off target. But on 10 minutes the referee took the decision that essentially ended the game as a contest. Jardim Brandao dithered on the ball in his own box and Marco Borriello dispossessed him before trying to go round goalkeeper Gianluca Curci. There was minimal contact and Borriello crumpled to the ground but the striker's last touch had been too heavy and left him no chance of reaching the ball before a back-tracking defender. Even so, the referee pointed to the spot and showed Curci a straight red card. Substitute goalkeeper Gianluca Pegolo's first task was to pick the ball out of his net. Siena battled on gamely, and on 26 minutes Massimo Maccarone escaped three defenders on the edge of the Milan box to bundle through before firing over on the stretch as Thiago Silva came across to put him under pressure. Two minutes later the lead was doubled as Andrea Pirlo curled a cross into the near post and Borriello hooked a brilliant volley over his shoulder and into the top corner. Ronaldinho proved a constant menace and had two early second half chances, flicking the ball over the bar with the first and being denied by Pegolo with the second. But 18 minutes from time he rose unmarked in the box to head home a David Beckham corner. The Brazilian sealed his first Milan hat-trick with a rocket into the top corner from outside the area a minute from time. Meanwhile, Juventus slumped to their seventh defeat in 10-games with a 1-0 reverse at Chievo that is sure to increase the pressure on under-fire coach Ciro Ferrara. Gennaro Sardo's stunning first-half strike proved to be the only goal of the game as Juve turned in a performance lacking energy and confidence which comes on the back of a 3-0 hammering at the hands of Milan in their last league outing. Juve dropped to fifth and out of the Champions League places as both Roma and Napoli overtook them. Roma moved up to third as on-loan Bayern Munich striker Luca Toni scored his first goals for the club in a 3-0 win over Genoa. Simone Perrotta opened the scoring on 17 minutes after a scramble at a corner and then Toni turned home Mirko Vucinic's cross on the stroke of half-time. And, on the hour mark, Vucinic turned provider again for Toni to head home his second. Napoli could not fully capitalize as they were held 0-0 at home by Palermo but still extended their unbeaten league run to 14 matches.